The Azure Enterprise Agreement makes it easier than ever for enterprises to use Azure. With the release of the Microsoft Azure Enterprise content pack for Power BI, you can now quickly import and analyze your Azure consumption data in Power BI. This data allows you to gain insights into which departments, accounts, or subscriptions are consuming the most. It also provides visibility into which service your organization used most and trends for spending and overall usage. 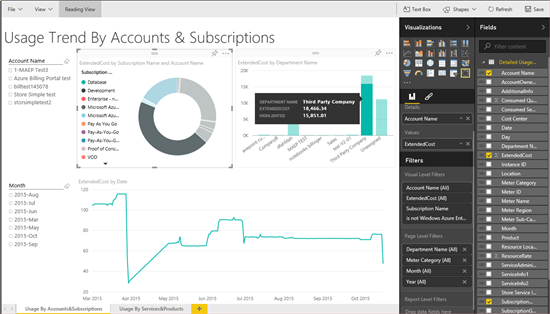 This post will explain how the Power BI content pack can help you analyze your Azure Enterprise data. 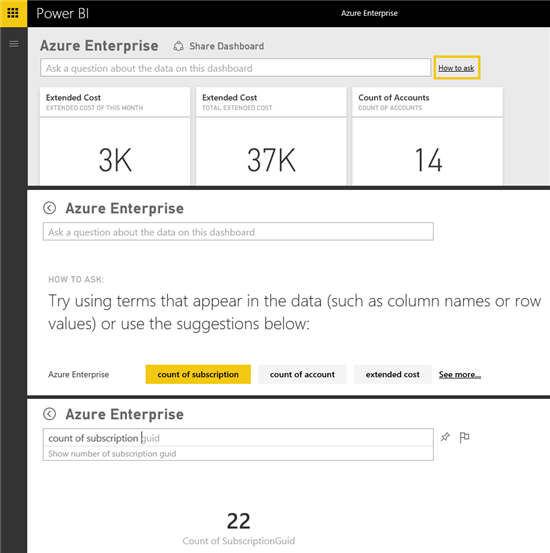 For additional details on how to get started, please see the Azure Enterprise content pack for Power BI help page. After connecting with your Azure Enterprise credentials, your data will begin loading into Power BI and you will be notified when the dashboard is ready. In addition to the dashboard there are two reports that you can drill into by selecting on of the tiles on the dashboard. The two reports provide insights into usage by Accounts & Subscriptions as well as further detail on usage by Services & Products. To begin exploring the reports, select one of the tiles on the dashboard. For example, if you select the Extended Cost donut chart it will drill into the Usage Trend by Accounts & Subscriptions report. Each report includes a set of visuals with different insights. For additional information you can hover over any of the items, or select a particular value to cross filter other visuals on the page. 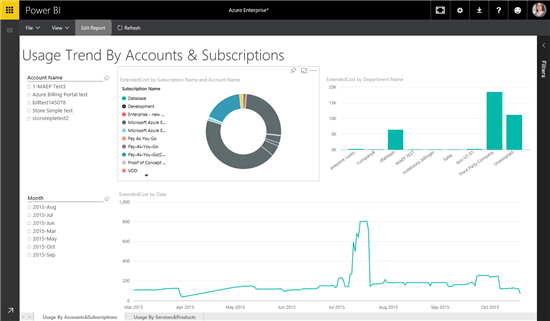 The Usage Trend by Accounts & Subscriptions report allows you to see your subscriptions usage by account and department. If you select an account name, the visuals on the page are cross filtered for the selected criteria. You have the ability to customize the report by selecting Edit Report in the top left corner of the page. The edit mode gives you access to the field list, allowing you access to any of the values included in the data set. It also gives you the ability you to edit or add visuals to your reports. Any of the visualizations from the reports can be pinned to the dashboard by hovering over it and selecting the pin icon. You can also try asking a question to explore your data. You can use the new “How to Ask” feature to get you started. It shows example questions that you could ask of the dataset to get quick insights into your data. After the initial import, the dashboard and the reports continue to update daily. You can control the refresh schedule on the dataset. 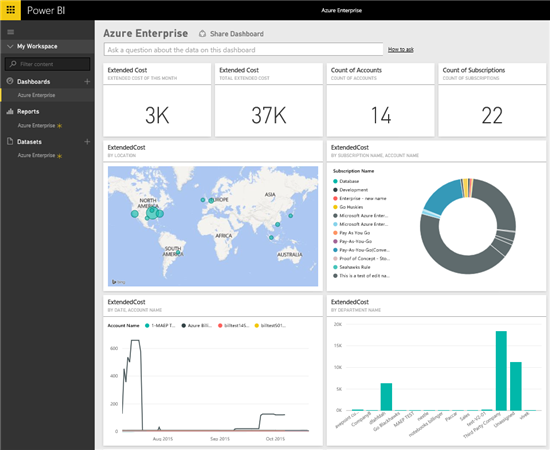 With Azure Enterprise content pack for Power BI, you have an initial set of metrics and insights enabling you to explore your Azure Enterprise data even further.